Water parks offer aquatic fun and excitement for the whole family. However, to prevent the thrills turning sour, it pays to be safety wise. A water park is an amusement park almost entirely devoted to water-based thrills. A typical park may feature water slides, wave pools, squirting fountains, slow moving rivers, tube rides and a variety of bathing pools. Water parks have a wide variety of features designed to amuse all ages and levels of thrill seeking, and so what it suitable one swimmer might not be appropriate for another. A rough wave pool might be inappropriate for a nervous non-swimmer. It is therefore important to take notice of the various safety precautions or regulations sign posted for each ride such as height, age, medical condition or swimming ability restrictions. Such regulations are based on manufacturer recommendations and risk analysis and if abused can prove dangerous. Unlike fairs, where each individual attraction is often independently maintained and supervised, theme parks are governed by the same organisation and will employ professional staff to ensure the safety of all its visitors. Nevertheless it is important to check there is a sufficient level of lifeguard supervision. Lifeguards are posted at each ride and swimmers are advised pay attention to their instructions. 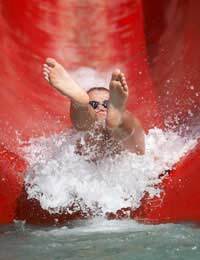 For example they will control the flow of water slide riders to prevent collision and may also insist on riders descending the slide in the safe position of face up, feet first and with arms and legs crossed. Water park visitors are not permitted to run in the areas around the pools and rides, because in a water park, slippery surfaces are commonplace, and could prove a hazard for the runner and others around them. Those that are not strong swimmers or are unable to swim at all should ask for the use of a life jacket. Many water parks provide these free of charge. Older children are spoilt for choice with the abundance of rides catering to their desires, but what excites them is usually unsuitable for the park’s smaller visitors, and so suitable alternative amusement is provided for them. Water depth is a danger for toddlers and so shallow paddling pools with sprays and fountains are available for their amusement. Small children should be instructed not to swallow the park water as this usually contains water cleansing chemicals such as chlorine. With toddlers it is worth checking whether plastic swim nappies should be worn, as this is a general rule of many water parks. The changing of nappies is usually restricted to designated and sanitised changing areas. Along with restrictions on height, age and swimming ability, many water rides also feature health regulations. For instance, high speed or rapid descent rides are usually blocked from use by pregnant women or people with heart conditions, neck or back problems or motion sickness. As many water parks are in the open air and largely visited in the summer time, it is important to protect the skin from the sun’s harmful rays. Sunscreen should be liberally applied to all exposed skin to ensure total protection, with extra attention to paid to small children. Whilst hanging around the area outside of the pools, hats, visors and shirts are recommended attire to prevent over exposure. Water shoes are ideal footwear for sunny water parks to prevent feet burning on the hot ground. It is also worth noting that bathing attire and ride surfaces are not always compatible. Nylon and spandex are ideal for slipping and sliding on surfaces with low water flows but materials like denim are not. Also accessories like metal buttons, belts and suchlike can get caught on slides and can spoil the surface.